Marvel's New Warriors: Who Is Squirrel Girl? It's official: Milana Vayntrub is playing Squirrel Girl in Marvel's New Warriors on the Freeform network. The latest entry into the ever-expanding Marvel Cinematic Universe introduces a handful of younger, lesser known superheroes, and Squirrel Girl will be the leader of the team. This is a departure from her usual role in the comics (in which, rather than being part of the New Warriors, she's a card-carrying member of the Great Lakes Avengers). A casual fan of Marvel's sprawling canon would be forgiven for not knowing much about Squirrel Girl. Compared to heroes like Captain America and Spider-Man, she's not nearly as popular as those titans, though she does have a passionate fanbase within the larger comic book community, which led to her unexpectedly becoming one of the most endearing figures within Marvel's roster. After her initial 1992 debut, Squirrel Girl was mentioned several times and made a couple of one-panel cameos (and was the subject of a truly bizarre-looking trading card), but she wouldn't make another proper appearance until 2005, when comic writer Dan Slott made her an integral member of the Great Lakes Avengers. The four-issue miniseries was a hit, and its influence is sure to be felt on the New Warriors TV show; like Squirrel Girl, fellow New Warriors television character Mr. Immortal wasn't part of that comic book team, but of the Great Lakes Avengers. Is She A Girl Or A Squirrel? 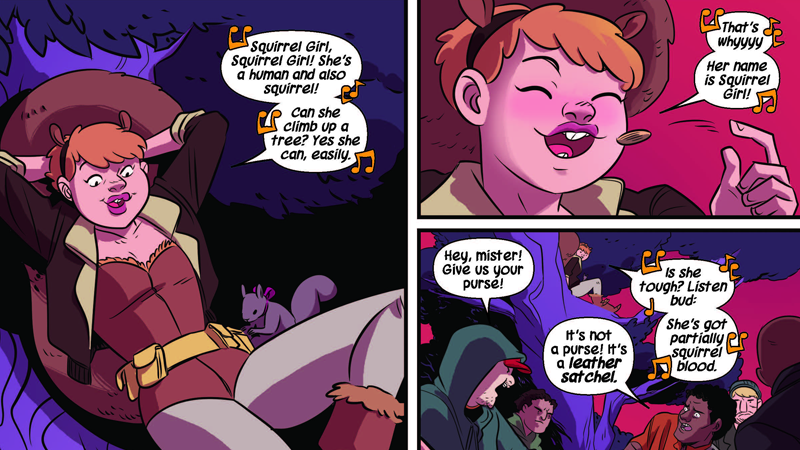 Squirrel Girl is a girl... And also a squirrel. According to her 1992 debut, she was just a regular girl who, at the age of ten, discovered she could communicate with squirrels. And then she developed squirrel powers, including an adorably cuddly tail, massive buck teeth (capable of biting through wood), squirrel-like agility, and the aforementioned ability to command squirrels to follow her orders... Plus, her lips taste like hazelnut. In addition to her quirky superpowers, Squirrel Girl has two main defining characteristics: optimism and sheer invincibility. For the first, Green is a character who never falls victim to the darkness and grim sensibilities that often plague most other comic book heroes. She's never going to be an alcoholic like Iron Man; she's never going to kill her own children like Wolverine, and she's never going to make a deal with the devil to save her aunt's life like Spider-Man did that one time. No, Squirrel Girl is just a plucky teen who loves being a superhero and beating up bad guys. Case in point: in the original Civil War storyline, The New Warriors were mostly killed at the Stamford Incident, in which the supervillain Nitro exploded on live television, killing over six hundred people. One of the survivors (and Squirrel Girl's romantic interest, though she herself was not present during the incident), Speedball, feeling guilt for his actions that day, decided to rebrand himself, from the charming and silly Speedball, to the dark and brooding Penance. 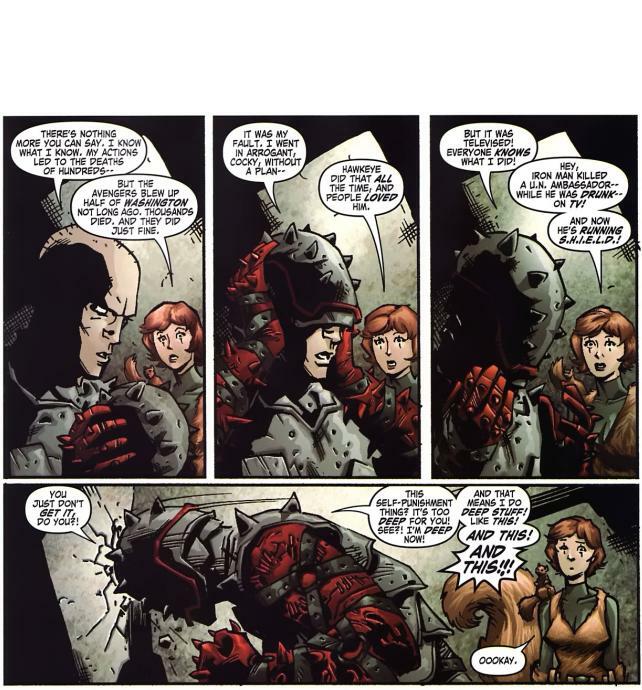 In a 2007 Squirrel Girl one-shot, the adorkable heroine confronts Penance about his unlikely transition from cartoon pretty boy to masochistic anti-hero, with writer Fabian Nicieza poking fun at Penance's over-the-top characterization and self-aggrandizing seriousness in the wake of the Civil War. Penance slams his head against a concrete wall, pain being the only way to activate his powers, and exclaims, "This self-punishment thing? It's too deep for you. See? I'm deep now. And that means I do deep stuff!" Speedball will appear in the New Warriors TV show, played by Calum Worthy; presumably, he won't become Penance in the series. Basically, Squirrel Girl is a response to, and a stabilizing force against, the more deadly serious side of Marvel Comics. Kind of like Deadpool, but less murderous... And more dangerous. Indeed, Squirrel Girl's other defining trait is her invincibility. They don't call her "The Unbeatable Squirrel Girl" for nothing. As already mentioned, her first appearance saw her defeating Doctor Doom on her own (with her army of squirrels), and her memetic power level basically became Marvel canon. While she always tries to talk her way out of fighting, opting to hear out the pleas of supervillains and negotiate for peace, when her conflicts inevitably come to blows, she's always prepared. Over the years, Squirrel Girl has beaten up Thanos, MODOK, Deadpool, and Galactus, among others. Deadpool fears her as the most intimidating opponent he's ever faced, and she can even take on Wolverine himself in a hand-to-hand sparring session (without his adamantium claws, at least). Just to poke fun at the incredulity of her victories over these nigh-invincible enemies, either Uatu the Watcher or her fourth-wall breaking Squirrel side-kick, Monkey Joe, confirm in the stories that Thanos and Doctor Doom, at least, were not clones or robots or other facsimiles; they were the real deal, and Squirrel Girl beat them up. In essence, Squirrel Girl's impossible strength is a joke at the expense of comic book fanatics who breathlessly debate the power levels of each Marvel hero when weighing the classic "who would win in a fight" argument. The answer, obviously, is Squirrel Girl. She would win. She's "Unbeatable," remember? Squirrel Girl is currently starring in her own title, The Unbeatable Squirrel Girl, which debuted in 2014. It's been praised for its cartoon art style, light sensibilities, and relatable characterization of its invincible protagonist. Prior to this, the most noteworthy Squirrel Girl appearances were in the Great Lakes Avengers miniseries, as well as associated one-shots and crossovers, all of which were conveniently assembled for a hardcover release in 2016. It will be interesting to see how much of the classic Squirrel Girl fans have come to know and love will make the transition from the page to the television screen. Will the Milana Vayntrub incarnation of the character be as insanely over-powered as her comic book counterpart? Will she have squirrel sidekicks capable of breaking the fourth wall? Will the New Warriors eventually become the Great Lakes Avengers? Time will tell, but anticipation is building up to a fever pitch for Marvel's New Warriors, which is scheduled to debut on the Freeform network in 2018.